My brief take: Oh, Rebecca Rasmussen, you did it again. You reached in and wrapped your hand around my heart with your lovely but heart-breaking story. I loved most of the characters – and the ones I didn’t you made me understand why. These characters leapt off the pages as did the settings (which played as big a part as the main characters). I should have been tipped off by the quote before the story begins: “Tell me the landscape in which you live, and I will tell you who you are”. It’s a story about the need for love and acceptance, and what happens when those are missing in one’s life. The question of ‘nature versus nurture’ ran through my mind with each generation. I loved what a minor character says at one point in the story: “Every time you think you need to hold on, let go“. Without spoiling the story I’ll just say I think book clubs would find a lot to discuss with Evergreen. Earlier I mentioned the story is lovely but heart-breaking. 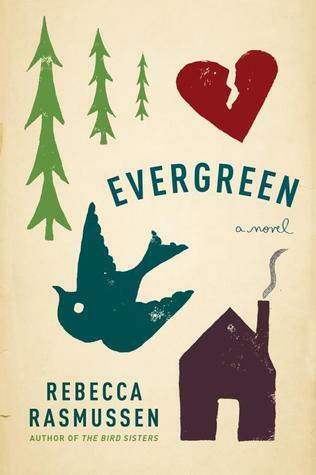 I turned the final page feeling uplifted and hopeful and so glad to have read Evergreen. I loved this author’s book The Bird Sisters…and I’m glad you enjoyed this one. It is on my list! Oh Mary, I am so glad you enjoyed the book. Your opinion means a lot to me, and this review just made me smile so much 🙂 I am a big softie, but you probably know that from my books!! Wow, your review has me sold! I’ll definitely keep this in mind for my book club. I’m so glad to see this is another winner and I can’t wait to read it!! Mary, What an enticing review, I can’t wait to read this! It’s unanimous! …. Your exceptional review sold everyone this book, as much as the synopsis itself! The review was brief and succinct, with just the right emphasis on the emotional points of the story and your love of reading the book shone through throughout. Rebecca isn’t an author I have come across before, however I shall definitely be keeping both books in mind for the future. You’ve made me really want to read this one! I think I’d really enjoy this book. Sounds great! It is on my TBR shelf!